520 pages | 100 B/W Illus. 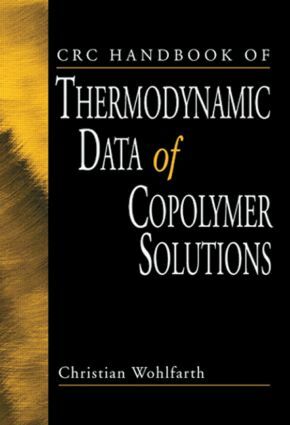 The Handbook of Thermodynamic Data of Copolymer Solutions is the world’s first comprehensive source of this vital data. Author Christian Wohlfarth, a chemical thermodynamicist specializing in phase equilibria of polymer and copolymer solutions and a respected contributor to the CRC Handbook of Chemistry and Physics, has gathered up-to-the-minute data from more than 300 literature sources. Fully committed to ensuring the reliability of the data, the author included results in the handbook only if numerical values were published or if authors provided their numerical results by personal communication. Carefully organized, clearly presented, and fully referenced, The Handbook of Thermodynamic Data of Copolymer Solutions will prove a cardinal contribution to the open literature and invaluable to anyone working with copolymers.